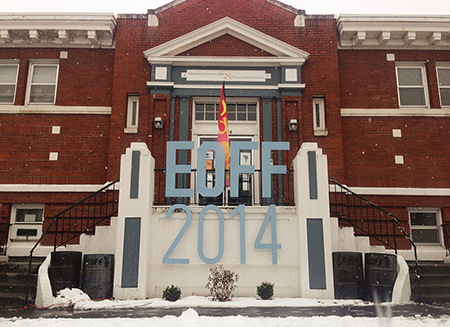 For the past six years, the organizers of EOFF have taken a fresh approach to the business of putting on a small-town festival. They run principally on grants and local support rather than submission fees, bringing a strong, sophisticated and personal point-of-view to their programming, and creating a filmmaker-centric sense of community amongst festival participants. They bring in filmmakers and bands (I saw great sets from Sad Horse and AU) according to their own taste rather than any received ideas of what’s hot or marketable, and put on nightly parties at the La Grande Art Center. One of the stars of this year’s EOFF was Chris Schoeck, the subject of Dave Carroll’s opening night film—the beautifully observed documentary Bending Steel. Chris has quite the character arc: at the start of the film he’s friendless and willfully self-isolating, but he’s in the process of finding his vocation in life: an ability to bend horseshoes, large spikes, and thick steel bars with his hands. By the end of the film he has evolved into a bit of a showman and has developed close friendships with a group of colleagues. He came to La Grande with the film’s producer Ryan Scafuro, and put on a series of live demonstrations of bending steel (with audience participation), bringing to life an old-time sideshow tradition that fit in nicely with the festival’s vibe. Friday kicked off with Robert Lepage and Pedro Pires’ Triptych, a film that goes to delightfully grueling extremes in its examination of its core themes of memory and the power of the human voice, allowing these themes to play out in its characters’ relationships and their drive for personal fulfillment. It’s adapted from a nine-hour play, and its three segments move boldly backward and forward in time. 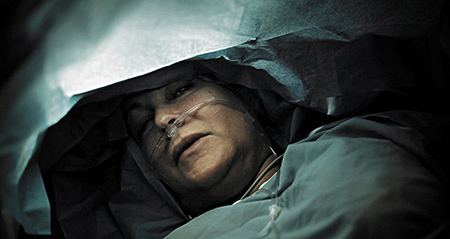 It features stunning, operatic performances by its four lead actors, and there’s a particularly shocking and beautiful scene of brain surgery being performed on a woman while she’s awake. 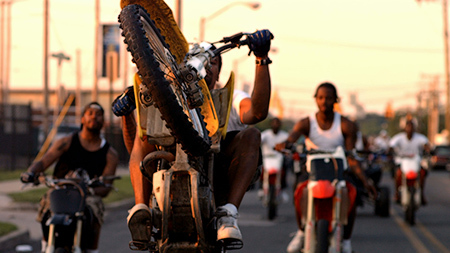 Lofty Nathan’s 12 O’Clock Boys follows a 13-year-old named Pug as he gets his first motorbike and gets involved in a truly wild scene in which Baltimore teenagers go marauding in the streets on their bikes, taunting and eluding the police that try to stop them. The film tries to understand the tough realities facing inner-city kids, examining their pent-up rage toward authority as well as the simple joy and sense of freedom in breaking traffic laws with your front wheel jutting up in the air like a middle finger. Pug and his exasperated mom are funny and charismatic, but they also struggle with the universal issue of kids breaking away from parents who have invested hopes and dreams in them. One of the most exciting films currently on the circuit is Bob Birdnow’s Remarkable Tale of Human Survival and the Transcendence of Self, by Eric Steele. It’s structured around a single monologue by a middle-aged, midwestern guy who’s recruited by his more successful friend to give a motivational talk to a team of salespeople. 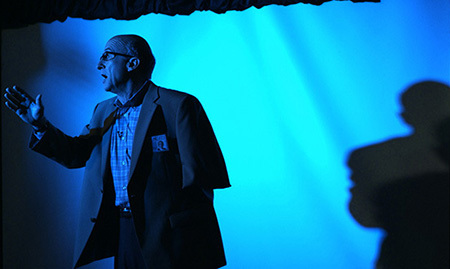 The talk quickly veers into over-sharing, as Bob goes into the most intimate details of a story of unspeakable horror. It’s a fascinating and intense trip into the heart of a simple man with a simple dream, who has learned some brutal life lessons. The screenplay by Steele is a thing of great power, tremendously sensitive and insightful, and the lead performance by Barry Nash (who played the role for several years on stage) is raw, inspired and seamless. Rich Hill, directed by Tracy Droz Tragos and Andrew Droz Palermo, screened at EOFF on the heels of its Grand Jury Prize win at Sundance. It follows three Missouri teenagers whose families are struggling with poverty. The filmmakers do a great job of developing trusting relationships with the boys: dark, disturbing circumstances are revealed as each of them is confronted with handling weighty, adult situations too early in life. All three boys still need to be parented, but their parents are variously overwhelmed, in prison, or rootless and somewhat delusional. It’s a film of fascinating character studies, but also a rich and detailed document of how a lot of people are living or just surviving in America today. 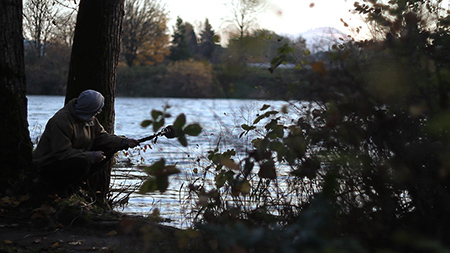 This year’s EOFF program had an online component, which included MMXIII, the new feature by Ian Clark (who co-programmed the festival with Ben Morgan). Long, organic, meditative shots featuring, for example, the gentle rustling of a bush, or the gradual movement of the moon in the sky, are captured within an austere, locked down frame. Edits are sharp, highlighting sudden changes in texture of background noise. The filmmaker is seen interacting with nature indirectly, wielding shiny new pieces of technology as if they were an extension of himself. He takes photos of his computer screen; he aims the image from a portable projector onto tall grass as an assistant becomes concerned about losing light. It seems to be a type of existence where interaction with the physical world is mediated by manufactured objects; maybe an experience inherent to working in contemporary media. Nature has been subjugated into image, but if there’s any sense of loss or protest it’s buried deep in the subtext; the film conveys a sense of the filmmaker’s easy acceptance of control over a compartmentalized world.